​of creativity, movement, & nature. Set amongst the tranquil woods, streams, and meadows of Spirit Fire Retreat Center, each day will begin and end with carefully sequenced yoga sessions in a peaceful, sunlit studio, led by Marci Rubin — bringing you back to the present in your body, mind, and soul. 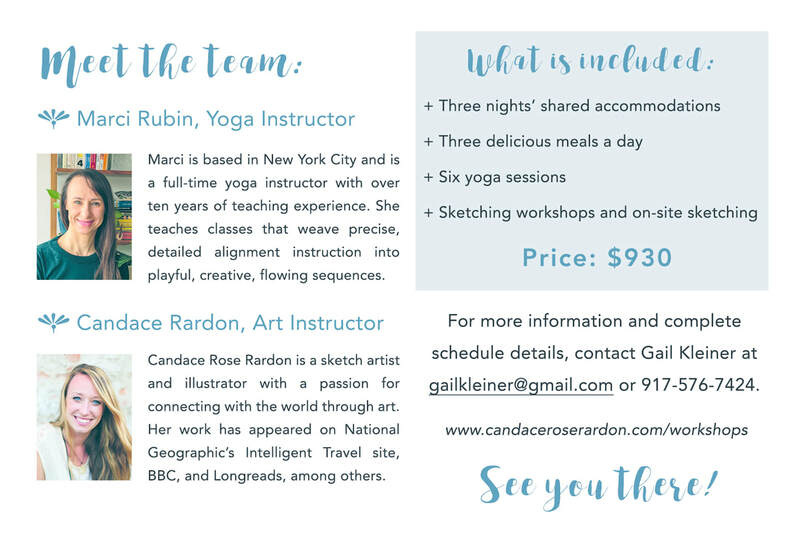 And Candace Rardon will be leading twice-daily sketching workshops in the dedicated art barn, as watercolor sketching is another incredible medium for observing the world around us — and within us — more mindfully. In between, there will be plenty of time for savoring organic, home-cooked meals; hiking secluded trails across the 95-acre property; and bonding by the campfire at night. In the end, you’ll not only return home refreshed and rejuvenated — you will develop powerful ways of catching more extraordinary moments from your life. at gailkleiner@gmail.com or (+1) 917-576-7424.